Westminster Abbey is a place of long memory. Over one thousand years of Christian observance and British royal ceremony are enshrined within its medieval precincts. Founded as a Benedictine monastery in 960, construction of the Abbey began under Edward the Confessor in around 1045. Dedicated in 1065 - just in time for the Norman Conquest – the present Gothic buildings took shape from 1245 during the reign of Henry III. The Abbey is home to 600 royal tombs and memorials including those of Edward the Confessor, Henry V and Elizabeth I. World famous for Poets’ Corner and the Tomb of the Unknown Warrior, the Abbey’s vaults also provide the final resting place for many national luminaries, including Geoffrey Chaucer, Charles Dickens and Charles Darwin. An estimated one million tourists to London visit its treasures every year. Joy and sadness walk hand in hand in the Abbey. A ‘Royal Peculiar’ - administered since the Reformation by the Sovereign rather than by a diocese - Westminster Abbey has celebrated 16 royal weddings and 38 royal coronations before its High Altar. It has also witnessed murder (in the 14th century in its Sanctuary), Puritan iconoclasm (under Oliver Cromwell in the 17th century) and minor damage caused by a suffragette bomb (in 1914). During the First World War - on the night of 24 September 1917 - a bomb dropped by a German Gotha aircraft fell on the Abbey's Choir School, but failed to explode. In 1997 the Abbey memorably oversaw the funeral of Diana, Princess of Wales and in 2002 that of the Queen Mother. It welcomed the first ever state visit by a Pope (Benedict XVI) in 2010. A millennium on the Abbey retains a powerful hold on the British public imagination, as an inspiring venue for national services and shared commemorations. 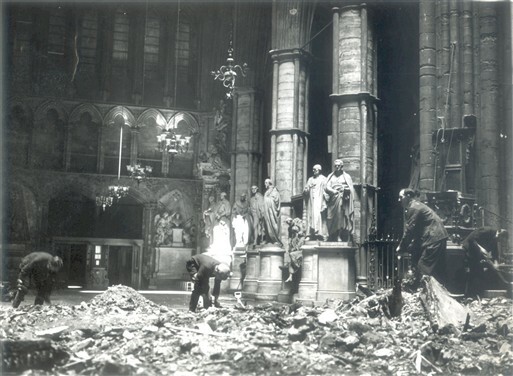 By May 1941, Westminster Abbey had both prepared for and experienced air raid damage. Following the outbreak of war on 3 September 1939, the Abbey dispersed many of its priceless historical artefacts to English country houses and to London Underground station tunnels, including Aldwych. The Coronation Chair (1297) was removed to Gloucester Cathedral and the Coronation Stone (captured from the Scots by Edward I in 1296) was buried in a secret location within the Abbey boundaries. The 13th century Cosmati stone pavement, in front of the Abbey’s High Altar, was boarded over for the war’s duration. As a precaution against anticipated blast damage, some 60,000 sand bags were placed around the Abbey’s royal tombs and its many leaded and stained glass windows were taped or covered over. The Abbey authorities established a 40-strong ARP warden group, made up of its own clergy, staff and volunteers, based in a control centre in the 11th century Pyx Chamber next to the Norman Undercroft and close to the Chapter House. A fire-fighting team was also stationed in Little Dean’s Yard in Westminster School after its pupils had been evacuated to Herefordshire. An air raid shelter was built in the 900-year-old College Garden and clergy and staff were trained in College Hall and in the Abbey Museum as fire-watchers, fire-fighters and first aiders. Water hoses were placed in readiness along the Abbey's 60-foot-high Triforium, a 13th century upper gallery (today used by the BBC as a vertiginous camera and commentary position). An improvised wooden block and tackle hoist was constructed in the Abbey’s echoing interior to supply equipment to the fire-fighters overhead and as an emergency escape route. Fire-watching observation posts were also set up at intervals high on the Abbey roofs. Staff prepared themselves mentally for the hazardous task of dealing with burning incendiaries at great height on a building of colossal national and historical importance. The Abbey was first damaged on 11 September 1940, when an anti-aircraft shell fell on Old Palace Yard, between the Abbey and the House of Lords, blowing out several leaded windows. 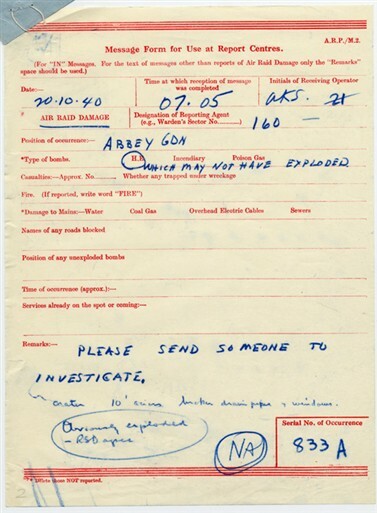 On 13 September slight damage was also reported by local ARP wardens after a second falling anti-aircraft shell exploded close to the Great West Door, carving out a small crater. The Choir School on Dean’s Yard was wrecked in a later attack. On 25 September, nearby St Margaret’s Church, Westminster (built 1482-1523) was fire-damaged by an oil-incendiary bomb. Two days later, a high explosive bomb fell in the same area and mutilated the Abbey’s Great West Window. This blast shattered other windows in the South Transept and in the 14th century Jerusalem Chamber. The walls of the Henry VII Lady Chapel (built 1503-16) were pockmarked. Shrapnel penetrated the Chapel wall: a small hole punched through the 16th century masonry is still visible in today’s RAF Chapel (opened 1947). 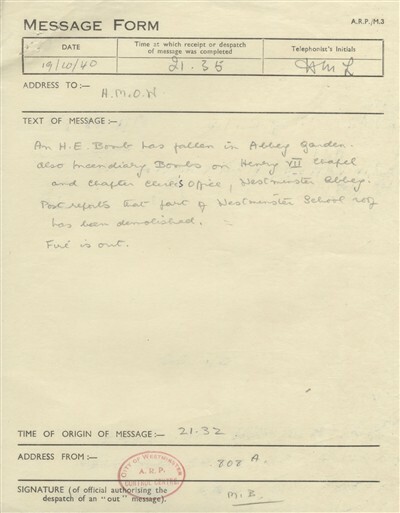 In October 1940, the Abbey suffered additional wounds. 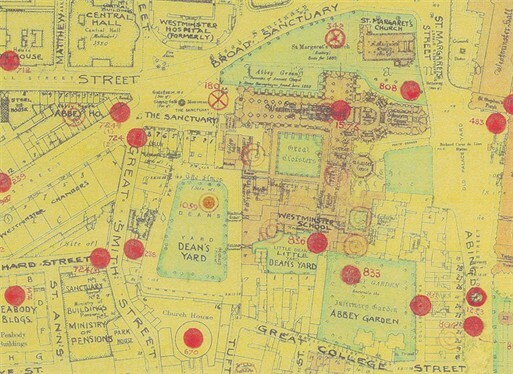 In the early hours of 19 October the Abbey Garden, library roof and cloisters of Westminster School (Little Dean's Yard) were damaged by separate high explosive bombs. 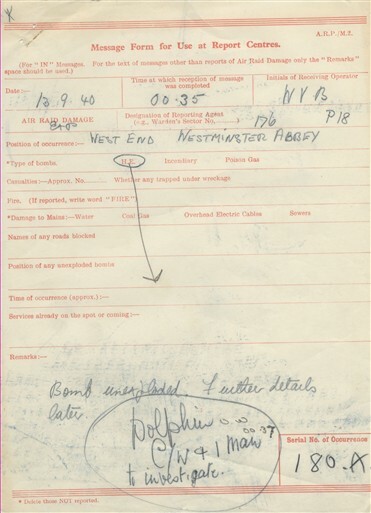 An ARP message noted by the Report Centre at Westminster City Hall (St Martin's Place) at 7.05am 20 October 1940 described: ‘a crater ten feet across in the garden, broken windows and a drainpipe’. Incendiaries also scorched the Henry VII Chapel and the Chapter Clerks’ office. 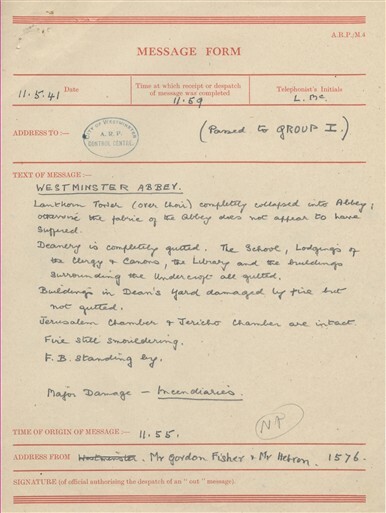 On 9 December, the Abbey’s fire teams were called to extinguish an incendiary alight on the roof of the Jerusalem Chamber and at 3.45am, 16 December 1940, City of Westminster ARP reported another burning in Dean’s Yard. On 8 March 1941, the Abbey ARP group tackled over a dozen more incendiaries falling in Dean’s Yard, on the roofs and on the South West Tower. Much worse was to follow. On the night of 10-11 May 1941, under clear skies and full moonlight, the Luftwaffe launched the most destructive raid of the Blitz. From 11pm to around 5.30am 11 May, over 700 tons of high explosive and 86,000 incendiaries were dropped across London. The Palace of Westminster suffered major damage. The Houses of Parliament were hit repeatedly, the House of Commons Chamber was completely destroyed and the medieval wooden roof timbers of Westminster Hall were set alight by incendiaries. Over 50 Fire Service pumps and their crews struggled to contain these huge blazes, just yards from Westminster Abbey. Water supplies soon ran low and had to be pumped in from the Thames, that night at its lowest ebb tide. Thousands of burnt pieces of paper - from a bombed local paper mill and burning rubbish dump close to the Thames - fluttered over Westminster. Westminster Abbey itself was fortunate not to be struck directly by high explosive bombs and no casualties were reported. But at around 12am, 11 May, the Abbey precincts and roof were hit by several 1kg (2.2lb) incendiaries. A key water main close to the Abbey was also broken by high explosive blast. Most of the incendiaries were extinguished by Abbey ARP wardens but one ignited, out of reach, among the wooden beams and plaster vault of the Lantern roof (1802) over the North Transept. Flames rapidly spread: burning beams and molten lead began to fall onto the wooden stalls, pews and other ecclesiastical fixtures 130 feet below. Despite this potentially fatal falling debris, staff dragged away as much combustible furniture as possible before they were forced to withdraw. It was a courageous action aimed at preventing the spread of fire further throughout the Abbey’s vast interior. Finally, the Lantern roof crashed down into the crossing, depositing a pile of heavy debris on the (boarded over) Cosmati pavement in front of the High Altar, damaging the pulpit and stalls and filling the Quire and Sanctuary with masonry rubble, charred timbers and splashes of super-heated lead. Elsewhere, other dangers threatened. More incendiaries hit the Abbey roof high above the Tomb of the Unknown Warrior in the Nave and on the roof of the Deanery. Two of the small magnesium blazes were extinguished by alert wardens but the third, at the Deanery, blazed out of control. Westminster Abbey was now in crisis. The Dean, Dr Paul de Labilliere, sent a message to 10 Downing Street to warn of the Abbey’s plight. In response, Prime Minister Winston Churchill (staying overnight at Ditchley Park, Oxfordshire) relayed his own, characteristic, message back to the fire crews: ‘The Abbey must be saved at all cost’. Nevertheless, with the overstretched Fire Service fighting the major conflagration at nearby Westminster Hall and with the local water mains ruptured, water supplies inevitably ran out. At around 1am, the Abbey’s emergency water tanks were exhausted and the water pressure failed. The hose nozzles sputtered and ran dry. Without the necessary water, the Deanery was consumed by fire, along with other sections of the Abbey roof, and Cheyneygates (13th century Benedictine Monastic rooms over the entrance to the Abbey cloisters). The Abbey’s interior honey-coloured stonework and high gothic vaulted ceilings were blackened throughout by smoke. Abbey buildings in an area running from Little Cloister to Dean’s Yard were all destroyed. Next to the Abbey, the 16th century Westminster Upper School Hall (formally a monks’ dormitory), several clergy houses and the Library roof were completely burnt out, although the 14th century College Hall, Jericho Parlour and Jerusalem Chamber emerged unscathed. Salvation came in the early hours of 11 May, after Fire Service reinforcements finally arrived at the Abbey with sufficient water. The remaining fires were brought under control. ‘Burnt paper, from some demolished paper mill, was falling like leaves on a windy autumn day…there were fire engines and the policeman at the door said to me “There will not be any services in the Abbey today, Sir”, exactly as if it were closed for spring cleaning’ (Sir John Colville, The Fringes of Power, Downing Street Diaries 1935-1955, 1985). ‘Lantern Tower (over choir) completely collapsed into Abbey; otherwise the fabric of the Abbey does not appear to have suffered. Deanery is completely gutted. The School, lodgings of the Clergy and Canons, the Library and the buildings surrounding the Undercroft all gutted. Buildings in Dean’s Yard damaged by fire but not gutted. Jerusalem Chamber and Jericho Chamber are intact. Fire still smouldering. Fire Brigade standing by. Major damage – Incendiaries’. King George VI and Queen Elizabeth subsequently visited the Abbey to inspect the damage. They were photographed in front of the High Altar where both had been crowned almost exactly four years earlier, on 12 May 1937. 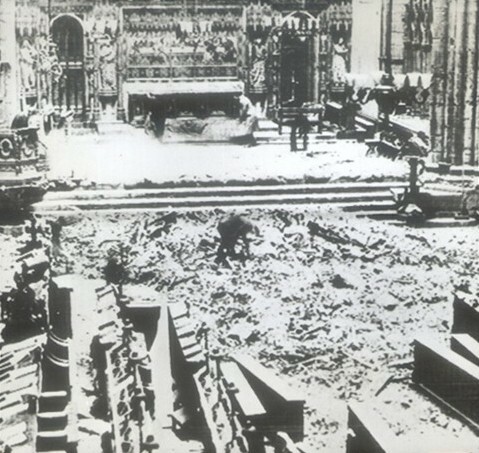 Westminster Abbey sustained no further air raid damage for the rest of the war. Services resumed using the Nave altar until 1945. Learning the lessons of 10-11 May 1941, the Abbey’s ARP teams installed a series of fixed iron roof access ladders, a new system of water hosepipes and standby water tanks on the Abbey Green. In February 1944, several incendiaries fell close to the Abbey just outside St Margaret’s, Westminster and in Parliament Square, but were promptly put out. The Lantern roof was rebuilt after the war by Stephen Dykes Bower, Westminster Abbey’s Surveyor. Interior stonework was cleaned painstakingly in the 1960s and restored to its original colouring. Further major restoration took place during 1995-1998. On 29 April 2011, the Abbey took centre stage again. The Royal Wedding of HRH Prince William and Catherine Middleton drew a worldwide television audience of over two billion people. This page was added by Ronan Thomas on 28/04/2011.